Today, you are 9. Sometimes I think it is amazing that you have been a part of my life for so long. But other times, I feel as though I’ve known you forever. As my first-born, you have changed me the most, first, by making me a mother, secondly, by forcing me to always think of someone else’s needs before considering my own, and continually, by growing and changing: just as I think I have finally gotten a handle on raising an eight-year-old, you go and turn nine! 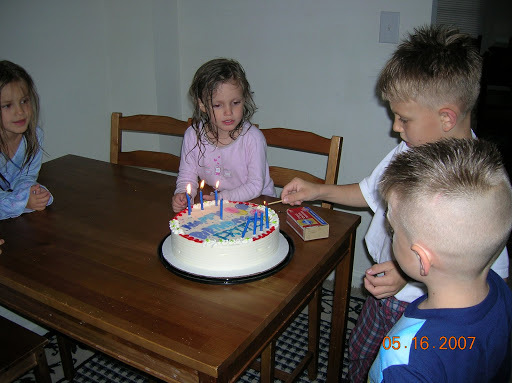 You are old enough to light the candles on your birthday cake all by yourself, and you have no idea how terrifying this is to me. Happy birthday, big guy. May the next nine years be as wonderful as these first nine years. Dairy Queen ice cream cake is very easy to “make” !! Happy Birthday Fritz! I hope you had a great time!